There were two goals for this project. The first goal was to clear out all the invasive plant material and dead trees and shrubs. The second goal was to create a safe area to walk the dog. The challenge was understanding the topography which was totally covered by the invasive and dead plant material. The topography was found to be quite varied and contained much ledge. 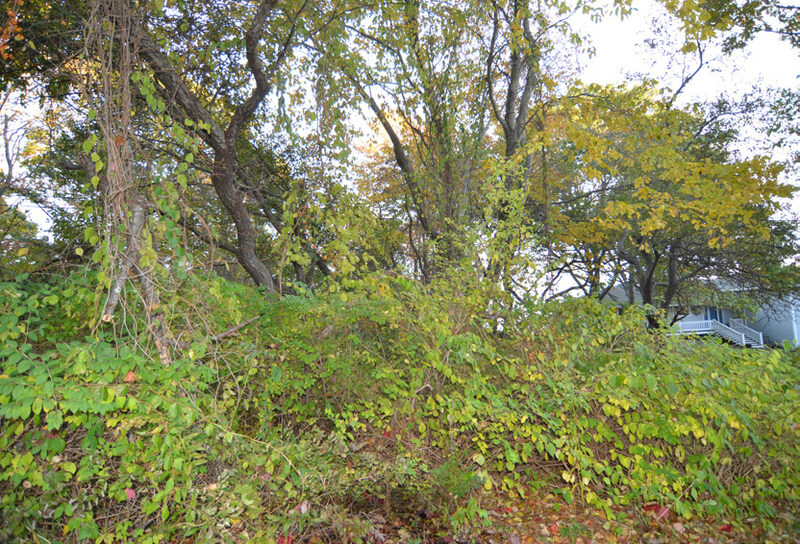 BEFORE construction, the site is overgrown with bittersweet, honeysuckle and dead trees. 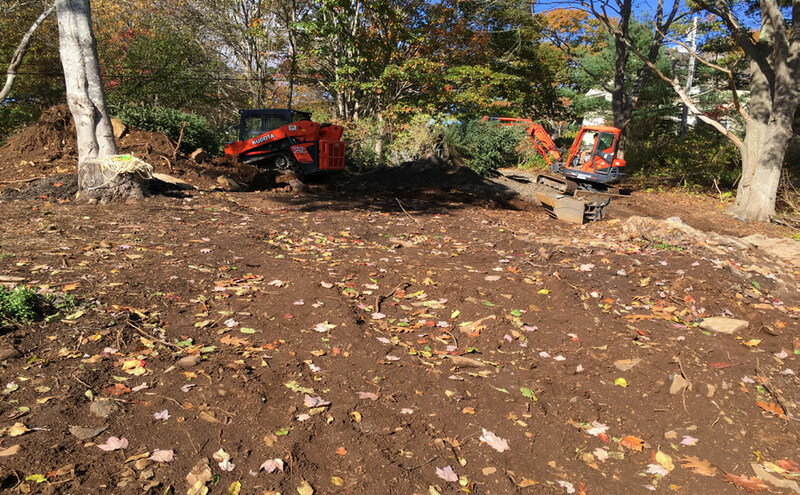 During construction, excavator and skid steer are used to clear the site and grub out all the root systems. The photos above show the site at project inception. Bittersweet had grown up into trees, killing many of them. The dead trees were cut up and hauled away. An excavator grubbed out all the surface invasive and dead plant material and then grubbed out the extensive root systems. A large buried ledge area was exposed. Erosion control wood mulch was used for the pathways, installed over landscape fabric. The photos above illustrate construction methodology to achieve landscape design. The ledge area was totally buried when the excavator bucket hit the ledge. With mechanical and manual effort, this large area of ledge was exposed. 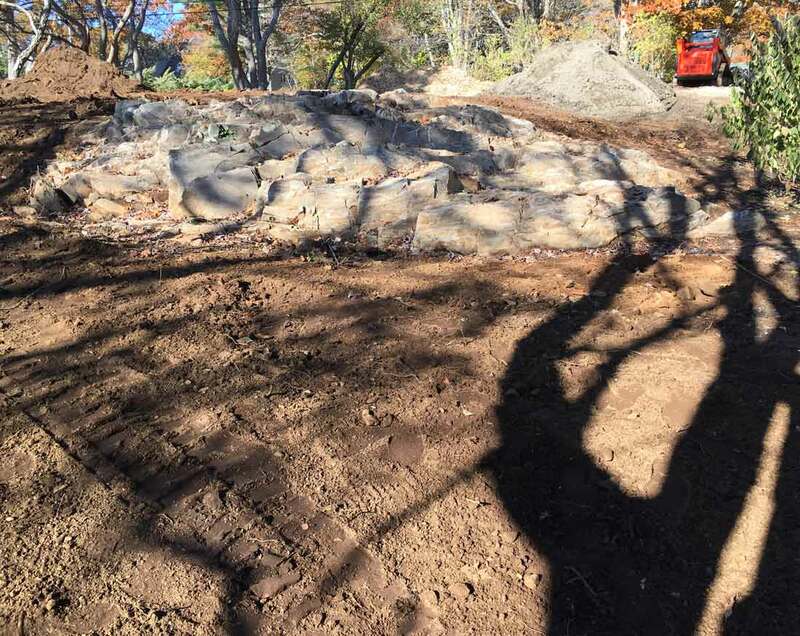 It adds dimension to the landscape and is a built in landscape element to achieve the grade change between the upper and lower sections of the area. The pathways were created by following the planting bed outlines. 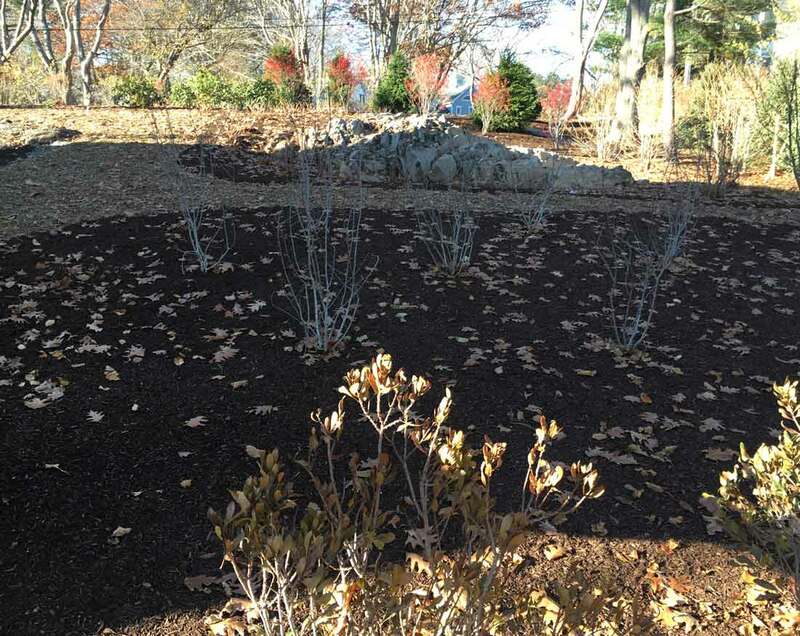 The photos show two tones of mulch, the darker is the planting bed mulch and the lighter is the erosion control mulch for the pathways. 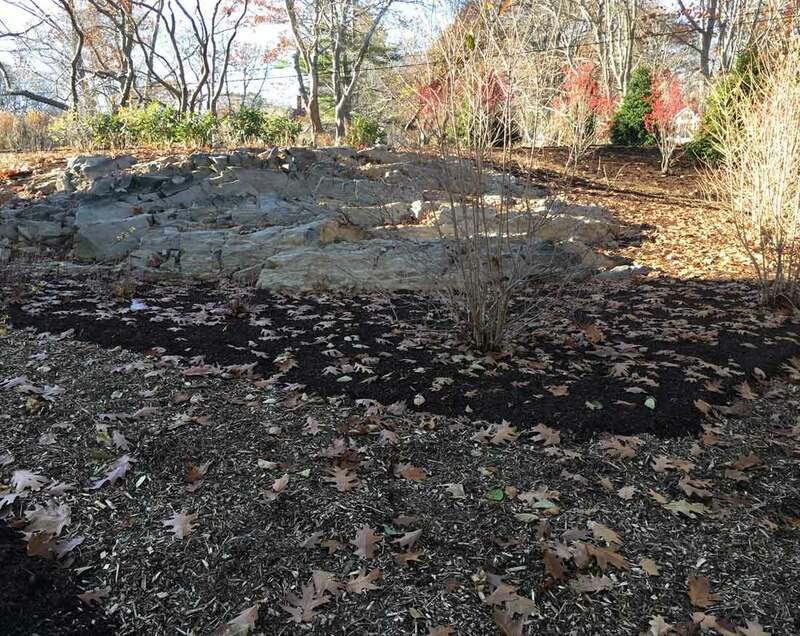 An erosion control mulch is soft to walk on and has a contrasting texture and color to the plant mulch. 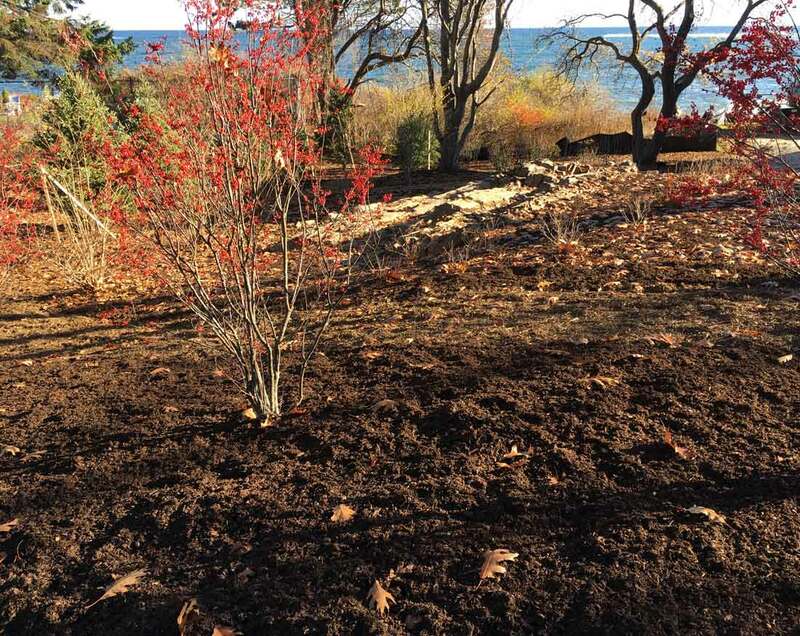 Native plants were used to create a foundation for the development of a natural habitat. The pathways lead from the lower area in foreground to the upper area circling the ledges. The site was extremely ledgy necessitating planting where possible and deviating from a more natural flow. Native plants were used to create a habitat for wildlife. 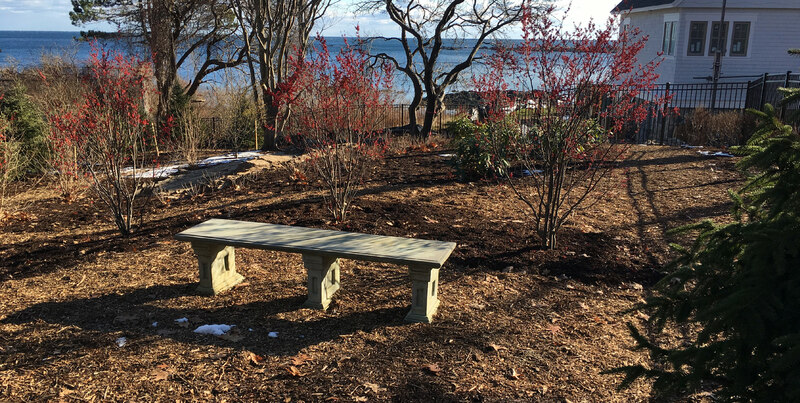 The pathways extend around the perimeter and throughout the landscape, around the ledges and to two seating areas. More planting may be added in a second phase to increase low height plant density.